Serving the Eastside communities of Los Angeles; Silver Lake, Echo Park, Los Feliz, Atwater Village, and surrounding areas. You are welcome to email me at ErikaHirschMFT@gmail.com, call me at (323) 825-1599, or fill out the Contact Form below. My rate is $135 per 50 minute session, for either individuals or couples. I do not offer a sliding scale option at this time. Have you ever hesitated to talk about something because you didn’t want people to think of you differently? Or felt that you aren’t the type of person who “should” be having these problems? Do you find that you are hard on yourself for not handling things “on your own” and are thinking of seeking extra support? When a new client walks through my door and tells me their story, the most important thing I can do is openly listen to the person and not pathologize or judge him or her for the difficulties that they are facing. One statement I strongly believe in, is; “The person is not the problem, the problem is the problem” (David Epstein and Michael White). Part of exploring a person’s unique story is to remember that they are a whole person, no matter what obstacles are causing a struggle. I believe that a person is made up of more than just the challenges they face, and that is how I approach my work as a therapist. Looking at a person’s unique qualities, strengths and weaknesses together, helps us discover more comprehensive insight into specific thought patterns, behaviors, and emotions. Exploring your unique personal qualities is also an essential part in planning for the future. I enjoy helping people find their individualized path. If you feel like you are on a specific life path that doesn’t feel right or just feels like what is “expected” of you, we can work towards discovering what kind of path feels authentic and satisfying for you. I believe that this approach is what leads to a true collaboration in creating change in a person’s life. An essential element of good therapy is an atmosphere of thoughtfulness and compassion. Any change that you make can feel unsettling or make you feel uprooted in some way. When a person goes through any kind of change, it is vital that they have a therapist who is thoughtful of the challenges that they are going through and can provide the right kind of support. Feeling safe to explore difficult thoughts and feelings is also a part of this atmosphere that is created between a person and their therapist. Successful therapy involves creating a personal connection that fosters safety and emotional support. These qualities of the therapeutic relationship are as equally important as the process of tackling “the issues”. Psychotherapy, therapy, counseling, these are all terms to describe the process of challenging thought patterns, gaining insight into one’s emotions and behaviors, and creating new, healthy thought patterns and coping skills. I utilize a diverse mix of therapeutic tools, based on Cognitive-Behavioral Therapy, Narrative Therapy, Solution-Focused Therapy, Post Modern Therapy, and Humanistic Therapy, depending on the needs of my clients. I specialize in the treatment of Eating Disorders and am a Certified Eating Disorder Specialist through the International Association of Eating Disorder Professionals. Please visit the Treatment for Eating Disorders page of my website for more about my specialty. In addition to eating disorder treatment, I also have years of experience in helping clients with stress management, depression, anxiety, panic attacks, major life transitions (adjusting to college, moving to a new city, starting a family, career changes), grief and loss, processing trauma, and relationship issues. I also have experience working with children and adolescents. I am a Registered Art Therapist (ATR), and I enjoy bringing this creative component into my work with clients. Art therapy can be an incredibly effective tool in helping to process different life events, thought patterns, and emotions. It can also become a powerful coping skill that can be used outside of the therapy session. You do not need to be an artist to experience the benefits of Art Therapy. It is offered to any client who is interested in utilizing the techniques. 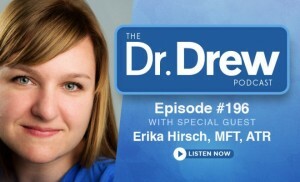 Please click below to listen to my interview on the Dr. Drew Podcast, talking about eating disorders and treatment.